2) do their best to achieve a similar degree of accomplishment in each area. 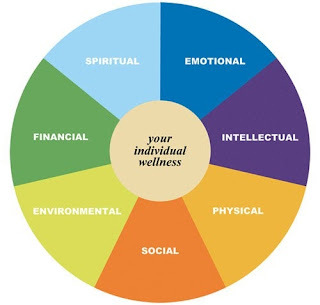 Of course, the education and scope of wellness goes much deeper than that description, but for timeliness purposes, it can start as a foundation for our discussion. Recently, a good friend/mentor of mine (Rick Miller) introduced to me a relatively different way to look at balance and wellness. Instead of referring to the wellness wheel and critically examining our behaviors, identifying areas in which we may be lacking, his notion about balance was very simple: if we put 100% into every activity we choose to spend time on, we have achieved balance. Our worry shouldn’t be that we aren’t doing everything; our focus should be on making sure everything we do is done well. Now, at first, this notion may seem like it lacks some credibility and/or substance. Hell… when I first heard it, I had to question its validity. Yet, let me give you some insight into my summer as a graduate student and how this “theory” of wellness applies directly to my everyday life. First off, it is important to describe my graduate degree and how unique it is in comparison to traditional higher education programs. It is called ‘Higher Education with an Emphasis in College Teaching (HETE).’ Customarily, higher education administration students take upwards of 27 credit hours (nine courses) in higher education. As a HETE student, I am only required to take 18 credit hours (six courses) in higher education, while I am expected to take another 18 hours in a discipline of my choice. In my case, it is psychology, and more specifically, I have a significant interest in organizational change/psychology. Although this is fairly easy to describe in the general sense, finding appropriate courses that fit my professional and academic interests has been very difficult. For example, those courses in higher education that I am required to take are only offered in specific semesters. Therefore, they have to take precedence over other psychology courses that interest me. In turn, I tend to either miss out on a class or two that I could have taken. To add insult to academic injury, multiple classes that deal with organizational dynamics or change theory have not been taught in years and the psych department tends to be light on educators who can successfully navigate those courses. Not looking to just take any psychology course to fulfill my requirements (and to ensure I would graduate on time); I looked into the option of taking an independent study this summer. As it turns out, after multiple conversations with my advisor and the head of the psychology department, I was able to secure three independent study courses with three individual professors. In general, I don’t think graduate students at the University pursue this option very regularly… which provided me with a very unique opportunity to cater my education to my career interests. 16 Papers. Two Months of Independent Study. Limited Oversight from Professors. Seems easy, right? Guess again. Although I am only halfway through my summer of independent study, I can honestly say that my sense of “balance/wellness” has been tested to the core. To successfully navigate just one independent study course, it requires an immense amount of time management skills and personal discipline. With three such courses at hand, I have certainly over-committed myself to my academics and sacrificed some of my other personal obligations: friendships/relationships, exercise, eating well, sleep, and maybe even my jobs/positions at times. All of my actions have been in an effort to avoid procrastination. In fact, I even put each individual paper on my Outlook calendar as a meeting, so as to ensure I stayed with the plan. In most cases, the average student would laud that effort. Yet, with such devotion to my academics comes that unavoidable question of balance: although I am excelling in my responsibilities for my Master’s degree, have I put myself in a vulnerable position by virtually ignoring other aspects of personal wellness? In reflection, this is why I find Rick’s advice so profound. Clearly, in the midst of working two jobs that routinely comprise up to 11-12 hours of my day, along with my academic responsibilities, my volunteer experiences on a regional and National level, and the basics of living (fun, socializing, cleaning, cooking, laundry, working out, etc. ), it is almost impossible to live a well-balanced life. Therefore, perhaps my energy should not be spent striving for something (“balance”) that is in all actuality, unattainable at this point in time. Instead, I should take Rick’s advice and make sure that everything I do (even if it isn’t everything I would like to do) is done to the best of my ability. 100% effort, no excuses.